With over 240 pages, this year’s Marketing Management Book of the Year is a must read for any marketer grappling with the fast-paced environment of today’s marketing. 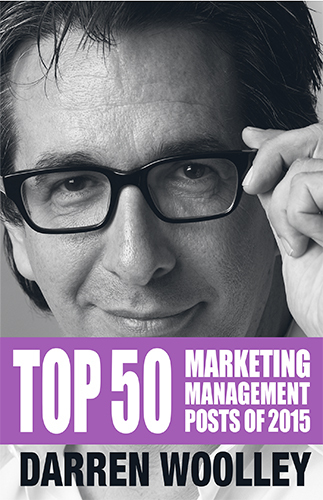 This is a third year in a row that TrinityP3 has published the Top 50 Marketing Management Posts of 2015 and it continues to grow in popularity and prominence amongst the marketing, procurement and agency industry. Covering a wide range of hot marketing topics from digital marketing to agency management, procurement, production and everything in between. All the contributors are subject matter experts with more than 10 years industry experience, giving practical insight into the complex world of marketing. 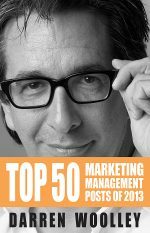 Darren Woolley’s Top 50 Marketing Management Post of the Year is a remarkable mosaic of must-read articles and expert opinions that will open your mind, offer new perspectives and challenge you in the process. I consider theft a great compliment and I admit that I’ve been stealing great ideas from Darren Woolley for years. Darren’s unique and forthright industry perspective comes from a deep understanding of the needs of both advertisers and agencies. It is rare to get such an insightful holistic perspective on the issues and opportunities that shape today’s fast paced marketing industry. Peter Levitan, Author of “Buy this Book. Win more pitches” and Boss, Peter Levitan & Co. The posts by Darren Woolley and the TrinityP3 team are critical insight. First of all, they provide a glimpse from a unique place in the world — Asia – and yet are truly universal. The collection of top posts gives professionals in our industry fantastic “food for thought” as we go about our hectic lives. He and the team are truly well respected experts and their intelligence is world class. Darren Woolley is a true industry thought leader who has inspired me on countless occasions with his insights and unique points-of-view. 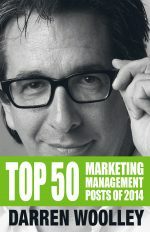 Trinity P3’s Top 50 Marketing Management Posts is an incredibly valuable collection that will inspire you, too. A must-read for anyone in this ever-changing, increasingly difficult-to-navigate industry. Darren’s ‘book of blog” articles is an essential read for any marketer who wants to open their mind to what could be. His points of view often challenge our way of thinking. He provides perspectives that deviate from the status quo, which can initiate some very productive discussions. I have had the pleasure of conversation and debate with Darren over the years and I am richer for it. Darren’s strength is that he always acknowledges the elephant in the room. In so doing, he provides vibrant, provocative, action-oriented ideas, alternatives, solutions and thought leadership on the expanding remit that is marketing. If change is the constant Darren’s posts are a valuable tool for currency and content for today’s marketers. One of the biggest challenges we face as entrepreneurs and innovators is understanding how to make our ideas resonate. We tend to have no shortage of ideas, but we struggle to tell the story of how they are going to be useful in the world and why they will matter to people. Marketing is the way we communicate how our ideas translate to value for people in a marketplace. This is more than a book from a ‘pitch doctor’. Darren and his team are at the epicenter of thought leadership and practical application in Marketing today and tomorrow. A must read.